Gary Knapp sent me this great story about his Mom (Florence Kline Knapp), and her sister, his Aunt Grace Kline Gray, during their card-playing days in the 50’s and 60’s. I will also post a copy on the Stories tab, but it was so good, I just had to share it as a post! trips down to see the old farm in Rootstown and Randolph. We did a lot of visiting – Uncle Gus in Rootstown, Uncle Joe in Ravenna, Uncle Irvy in Bucyrus, Aunt Martha in Ravenna. But one of my fondest memories was our visits to see Aunt Grace. This was in the late 50’s and early 60’s. It was usually on a Saturday night that we went to see Grace. I remember that Aunt Grace lived with a friend of hers, I believe her name was Gladys Brainard. Of course, this was after her husband, Homer Gray, had passed on. But what I remember vividly was the four of us sitting around a table in this old house in Ravenna playing cards. I learned from the masters! We played euchre, pinochle, hearts and spades. Now, I know what you must be thinking. Poor, poor Gary! Having to sit and play cards with those old ladies on a Saturday night! Well, the truth is, I really enjoyed those evenings and I learned a lot about life from those women. One thing that really stood out about my Aunt Grace was how she loved to laugh. She was great fun to be around. Now when I first met my wife, Cathy, I had to get her into the Knapp swing of things – like playing euchre. She had never played euchre before, so we had to teach her. I thought she picked up the game pretty quick, but I guess she was not fast enough for my mom. One day we were playing. Mom and Cathy were partners and Joann and I were partners. Cathy had already misplayed a couple of hands and she was quite flustered. Well everyone started laughing – everyone except Cathy that is. Since that day, whenever the Knapps play euchre, I look at my wife and say *“How hard can it be, it’s only 5 cards!” and we both laugh. 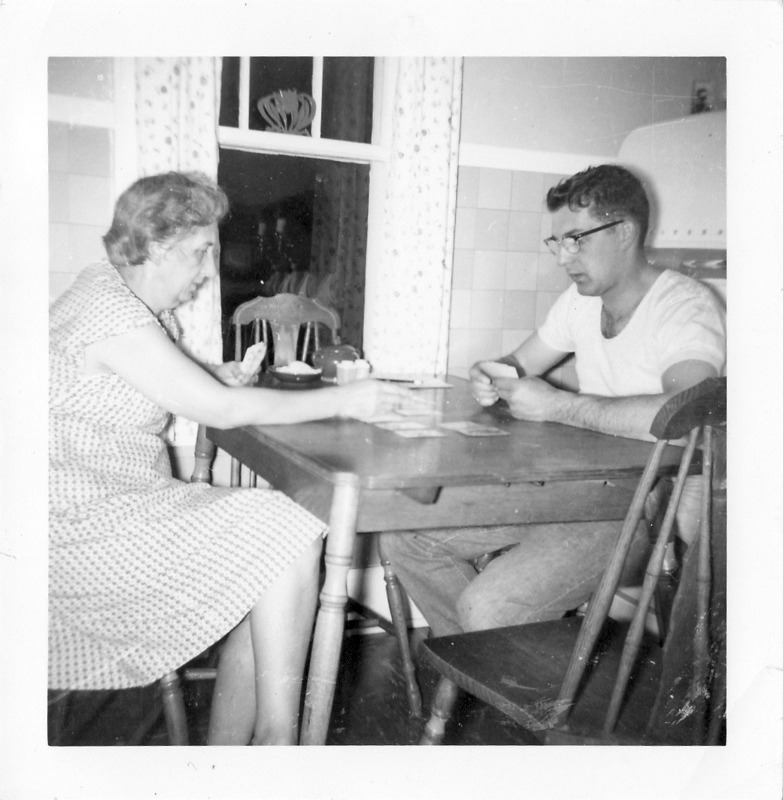 This entry was posted in Family History, Photos, Stories and tagged Cathy Knapp, euchre, Florence Kline Knapp, Gary Knapp, Grace Kline Gray, John L. Knapp. Bookmark the permalink.